All are bacteria that are often found in the nose and throat of healthy people, and which cause other common conditions, such as acute bronchitis and ear infections . A viral upper respiratory infection such as the common cold often occurs just before developing a bacterial infection. 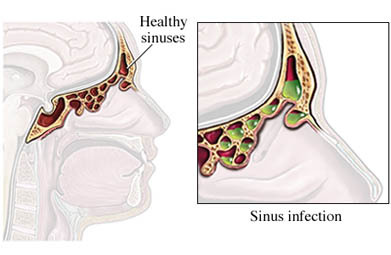 What are the risk factors for sinusitis?What are the symptoms of sinusitis?How is sinusitis diagnosed?What are the treatments for sinusitis?Are there screening tests for sinusitis?How can I reduce my risk of sinusitis?What questions should I ask my doctor?Where can I get more information about sinusitis? Acute sinusitis in adults. EBSCO DynaMed Plus website. Available at: http://www.dynamed.com/topics/dmp~AN~T902952/Acute-sinusitis-in-adults . Updated September 12, 2016. Accessed August 15, 2017. Chronic rhinosinusitis. EBSCO DynaMed Plus website. Available at: http://www.dynamed.com/topics/dmp~AN~T115673/Chronic-rhinosinusitis . Updated August 7, 2016. Accessed August 15, 2017. Sinusitis. American Academy of Otolaryngology—Head and Neck Surgery website. Available at: http://www.entnet.org/content/sinusitis. Accessed August 15, 2017. 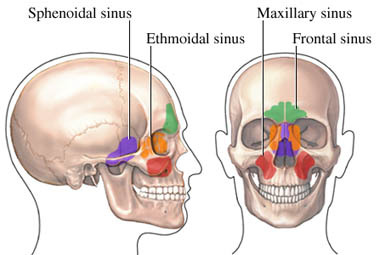 Sinusitis overview. American Academy of Allergy, Asthma & Immunology website. Available at: http://www.aaaai.org/conditions-and-treatments/allergies/sinusitis.aspx. Accessed August 15, 2017.